One day, a man named Roger arrives at the farm with the most curious contraption Helen’s ever seen: a horse-drawn van covered with books, with a living space in the center. Roger introduces his bookmobile as the Parnassus and tells her about his travels selling books all through the country. When he tells her that he came hoping to sell his bookmobile to Andrew, who had gone out for a few hours, Helen knows her brother would jump at the chance to own it — but for the good of the farm, she can’t let him have it. He would never get any work done again! Instead, she buys the Parnassus herself, and she embarks on a grand adventure with Roger, his horse Pegasus, and his trusty dog Bock. I received this book in my Book Riot Quarterly Box, and although I’d never heard of it before, I immediately knew I would love it. And I did! At 142 pages, it can pretty easily be read in a sitting, and I was so utterly charmed by every sentence that I couldn’t help doing just that! I mean, it’s a book about a bored, unmarried, middle-aged women who buys a horse-drawn bookmobile and sets off to claim her freedom with a man who deeply loves books. She’s thrilled to get a taste of the adventure that her brother has taken for granted, and she’s delighted to play a little trick on him; how shocked he’ll be when he comes home and finds her note! I probably had a huge grin plastered on my face the entire time I read this. It’s light, and fun, and sparkling with wit and mischief. Plus, it’s about people selling books, so there are some perfect little passages about the magic of books and of literary discussion. Parnassus on Wheels is oozing with charm, and it’s a joy to read. I would highly recommend it to anyone who loves books! It really is the most charming of books, a treat for lovers of books. This has been on my TBR list for awhile, so I was thrilled when it showed up in the box! I’ve been saving it for the readathon this weekend, so I’m very much looking forward to being charmed. This would be a perfect readathon book! Enjoy! So funny that you discovered Christopher Morley much as I did . . . totally by accident. Picked up “The Haunted Bookshop” in a second-hand book store somewhere years ago and finally got around to reading it a few months back. Charming is the only word to describe it. 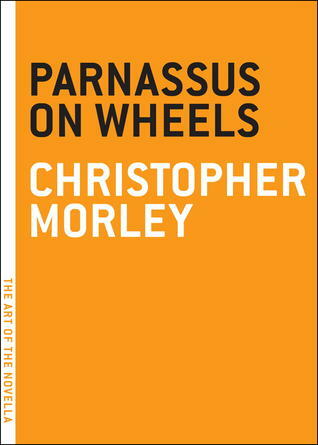 (I didn’t realize — until I was well into the book — that it was a sequel of sorts to “Parnassus on Wheels.”) I really have to go out and read that one. Thanks for a really nice review and for reminding me of how wonderful these little books are. This sounds absolutely delightful, and you know I loooove novellas! 🙂 Thanks for sharing! What are your favorite novellas? I need to read more of them! I can’t wait to start reading this now. I did not know anything about this book until I received it in the Quarterly Box.